Axonal Transport of Neurotrophic Signals: An Achilles' Heel for Neurodegeneration? The most effective treatments for neurodegenerative disorders, including Alzheimer's disease, will come from studies of the pathogenesis of age-related cognitive failure and understanding of the underlying mechanisms. Given the marked similarities in pathological and clinical phenotypes between Alzheimer's disease and Down syndrome, studies of the pathogenesis of one can be expected to complement and support those in the other. Alzheimer's disease and Down syndrome are characterized by dysfunction and loss of several biochemically and anatomically defined neuronal populations. The pathological involvement of hippocampus, in particular, is an early feature of both disorders, as is the degeneration of neurons whose axons innervate this region. Long, thin and poorly myelinated axons project from a number of subcortical and brain stem nuclei to modulate hippocampally mediated cognitive functions. In studies on mouse models of Down's syndrome, we uncovered evidence for the involvement of a particular neuronal population heavily innervating the hippocampus. In an extensive series of experiments, we found evidence that failed retrograde transport of nerve growth factor signaling in cholinergic neurons of the basal forebrain is linked to their vulnerability and that these changes are caused by increased gene dose and overexpression of the gene for amyloid precursor protein. 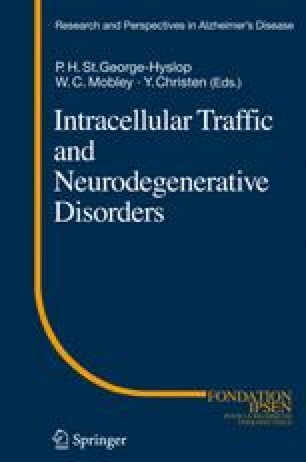 These findings raise the possibility that intracellular trafficking defects created by changes in amyloid precursor protein expression or processing make an important contribution to pathogenesis and set the stage for studies to explore the molecular mechanisms of degeneration of cholinergic neurons and to define new therapeutic targets for these neurons. An important unanswered question is whether or not similar mechanisms operate within other vulnerable populations, innervating hippocampus to cause de-afferentation and dysfunction of this critical brain region.